Some people have probably been waiting eagerly for a comparison of this particular game, particularly my Finnish friends, as it has some cultural significance for us. It was the first video/computer game ever to cause some political worry in our country, due to our history with the Russians, so it was also the first computer game at all to get any television exposure in our country. The story goes, a leftist member of our parliament went as far as to make a parliamentary question as to whether or not it was acceptable to sell the game, and the resulting debate ensured the game's popularity and high sales figures. Of course, you could well imagine the situation now repeat itself with similarly politically oriented games, such as Papers Please, but as of yet, no censure of games has happened following the beginning of the military proceedings in Ukraine. 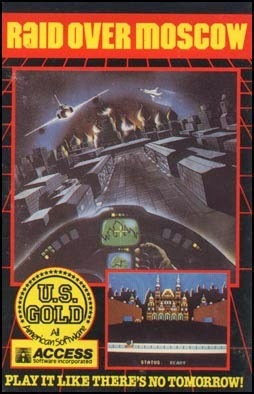 Around the end times of the "Second Cold War", Raid Over Moscow was a highly regarded game throughout the world on all the platforms it was ever released on. Now, it is a fondly remembered piece of gaming history that allowed us all for what was most likely the first time ever, to feel that a computer game could actually be as much a significant protest song as all the folk singers' anti-war songs. 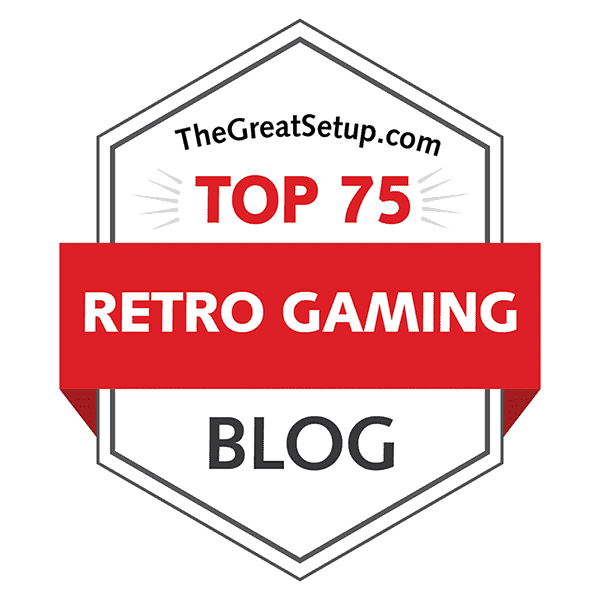 In addition to that, the game has some rather remarkable scores at all our favourite websites: Lemon64's users have given it a very fine 8.1 with 169 votes; 73 users at World of Spectrum have rated it with a respectable 7.67; Atarimania's rating is currently 7.4 with 54 votes, and for some reason, CPC Game Reviews have only given it a 6 out of 10, and I intend to find out why. The rest of the versions are difficult to find any reviews or ratings for, but the so far unknown Enterprise 128 computer has a very similar version to the one on Spectrum. Well, let us then have a proper look at them, and the rest of the versions as well. Access Software was already known from their earlier, remarkably well-received strategy/action title, Beach-Head. The men who brought us the said game, were also responsible for this slightly more controversial title. The controversy was caused by the title, which at the time of Cold War, was very risque, as if the game makers were provocating people to actually take action against the Russian government at the time. Naturally, the game had to be retitled for the later re-releases, and turned up as "Raid!! ", just to avoid more negative press, but to most of us who lived at that time, it will always be Raid Over Moscow. After a few paragraphs on the cultural impact of the game, I suppose it is time to speak of the game itself, and what is it like. Much like the two Beach-Head games, it is a multi-genre strategy/action game with a heavy emphasis on the action. The game starts off with an alarm, that the Soviets have launched missiles, the destination of which is some city from your country (this, naturally, being the USA). So you need to perform some counteracts, which starts off by your taking some aircrafts off of the hangar. Then you need to attack the city which sent those missiles off, and proceed through some heavily guarded areas, and destroy the enemy base. Having done so enough times, you get to destroy the Kremlin, and finally make your way to a nuclear reactor to fight against maintenance robots. If you manage to beat the robots within the time limit, and manage to get out alive, you get a better ending, although if you die while fighting the robots, the game will still be considered to be completed, albeit without any survivors. If you want an over-simplified description of what the game is fundementally about, it is mostly about judging distances, focusing on your altitude and aim, and shooting the hell out of your enemies. As are the two Beach-Head games, Raid Over Moscow is a fairly difficult game to get into for the average gamer, but in the end, is one of the most pleasurable and rewarding gaming experiences from this period of gaming history. Seeing its current status on the internet, and judging from my personal experience, it is also one of the earliest complex games with enormous replay value. Once again, the game has been released in both floppy disk and cassette formats, but for those of you who consider loading times of any interest, here are the fastest tape loading times I could find for all the machines. This, of course, drops out the Apple ][ and Enterprise 128 versions, and because of that, the final scores will not feature the optional loading scores. Loading screens. Top row, left to right: C64 tape, C64 disk (NTSC and PAL), Atari 8-bit tape, Apple ][. Bottom row, left to right: Acorn Electron, Acorn BBC Micro, ZX Spectrum, Enterprise 128, Amstrad CPC. And as usual, we shall have a look at all the available loading screens in this section. What is not apparent here, is the colour-flashing title and framing on the Atari loading screen, without which would be very dull indeed. The original C64 version didn't have a proper loading screen as such (nor does the Apple ][ version) - the tape version had the usual US Gold flag screen with a counter and a scroller at the bottom, and the disk loader didn't have even that. What the disk version does have, is a mission statement screen, which is basically the same screen as the main menu, but it has an endlessly long text scroller instead of difficulty selection. The only loading screen that has the full title appears to have appeared only on the ZX Spectrum - all the other versions have the shortened title in some form (with or without an exclamation mark). As usual, the BBC Micro and Electron have their own distinctive loading screens, which are otherwise quite similar, but the Electron has a blue-and-white monochrome version of it, and is cut down about a quarter from the bottom of the screen. 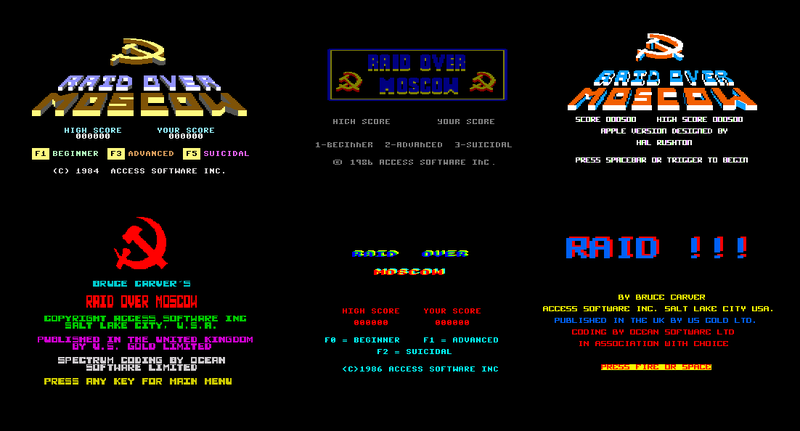 One of Raid Over Moscow's rare downsides is the amount of controls, which vary on each machine. Sure, it matters very little once you have gotten used to one version, which you will be likely to play in most occasions anyhow, but if you want to try out different versions of the game, here's as complete a guide as I could do for all the versions - at least as far as emulators go. Of course, the differences in each region's keyboards will still cause some head scratching, but you should get the bulk of the controls close enough to being correct. Most of the keyboard commands in the game need to be dealt with in the beginning of the game. The original C64 version requires you to press Space bar once the game has started, in order to enter the space station. Inside the space station, you need to be in mid-air in order to be able to open the hangar doors, which can be done by pressing F7. Other than that, joystick is all you will need, and being a game of many different scenes, the use of your joystick varies accordingly, which I will come to later on. As for the other, less useful keyboard commands - the Commodore key pauses the game, and CTRL key restarts the game. The ATARI version differs slightly from the above: instead of needing to press F7, opening the hangar doors can be done by pressing the Space bar while in mid-air. You can pause the game with the ESC key, and if you push 1, 2 or 3 in the middle of a game, you can restart the game with any of the three difficulty levels. For the SPECTRUM and ENTERPRISE 128, you have been given the choice to redefine the keys, but you can also use a joystick of your choosing. On the AMSTRAD, you can use either a joystick or the pre-set keyboard controls, which are in the familiar QAOP + SPACE format. In any of these three versions, no other extra keys are required to be used, but there is a pause key somewhere. The APPLE ][ version feels unresponsive when you play it on the keyboard, but it could have something to do with the emulator as well, I cannot really say. The keyboard controls act like you need to be pushing the keys in quick repetition for anything to happen, but then if you press the keys long enough, your plane starts turning and handling with an unusually vigorous momentum, which has only the ability to make you crash eventually. Using a joystick changes the playability to an immensely more pleasurable experience, but you still need the keyboard to open up the bay doors - this happens by pressing the D key for some reason. For some reason, I haven't had much luck in getting most of the ACORN games to work as well as I would have liked them to, due to rarely available joystick support and stupidly difficult-to-decipher keyboard layouts. Luckily this time, there is support for a joystick control, and I was also able to find all the necessary keys to make the game at all playable, and here's what I found: A = acceleration (or up), Z = down (no use in the hangar), comma = left, dot = right, * = fire button (changing altitude, firing), TAB = open bay doors, CTRL = quit to menu, ENTER = exit hangar, Q = sound off, S = sound on, P = pause on. I couldn't find a key for pause off, so if you pause the game by mistake, you will likely need to quit the game in order to get back into it by restarting. Now, I'm aware that these keys are not necessarily the same for all keyboards, but you can google up the keyboard mappings for a Finnish keyboard layout and see how it translates to your keyboard. That said, the keyboard controls are infuriatingly uncomfortable, and unwanted commands come too easily, not to mention strain on the wrist and fingers for bad positioning. So, a joystick is infinitely more preferable, even if the actual controllability leaves something to be desired, and you still need to remember at least the TAB key in order to get out of the hangar. Now, on to the gameplay itself. There are 6 sections requiring some actual input from the player, not counting the first screen where you need to press Space bar (or fire button) in order to get to the space station. The original C64 version starts off every time with a pilot walking his way down to the Stealth Fighter aircraft in the middle of the hall, which takes up quite a lot of time, when you have to wait for it every time. It could be considered a cinematic section of sorts, which is the bane of modern gaming, but it was fancy back then, however unnecessary. All the other versions skip the walking bit, which makes the gameplay more flowing, but it also makes you less nervous about getting the exiting right the first time, because you don't want to endure the slow walking bit more times than you really have to. Because it can be considered both a plus and a minus, I will not pay any attention to it when giving scores. Once your aircraft has gained enough power to make itself move, you will start moving left by default, which is the wrong direction. You need to lift your aircraft off the floor in order to be able to open the hangar doors, and get out. The controls for opening the hangar doors has been explained above for each version. What makes this bit trickier than you would expect is the way your aircraft behaves in zero-gravity, and that the hangar doors stay open only for a short period of time - which is more than enough, really, once you get the hang of the controls. I'm not really an expert on physics, so I can't really explain all the minor differences in all the versions, but there are some more major differences as well, which will make your playing experience more bothersome. The AMSTRAD version handles way too quickly and the maneouverability of the aircraft is somewhat different, enough to make it a lot more difficult to get the aircraft out of the hangar. In contrast, the ACORN version is way too slow, making it feel unresponsive, although I'm not entirely sure it is. The SPECTRUM/ENTERPRISE version isn't too bad, but it is a bit on the slow side, and you can't see the shadow under your aircraft, which makes it more difficult to get the aircraft out of the hangar, because you need to be looking at the altitude meter as well as the action screen. On the ATARI, the handling is just as good, if not slightly better than on the C64, but it's so minor that I can't really tell whether I like any of the two better. There is one very big difference, though - you don't need to lift your aircraft off the floor before opening the bay doors. The same applies to the APPLE ][ version, provided that you are using a joystick. While the original version, as well as the ones on ACORN computers, ATARI, SPECTRUM and ENTERPRISE 128 make you automatically go into the next section once you're out of the hangar with your first aircraft, on the AMSTRAD and APPLE ][, you will be automatically going for the next aircraft, unless you tap the Space bar (or other designated key) to exit the hangar. The next screen brings you back to the satellite view, where you will have to control one aircraft at a time to the attack zone, which is one of the triangular city marks on the Russian side, which will be recognized as being the white one amongst the black ones. The original C64 version has the movement of the Stealth Fighter quite slow, which makes you even more nervous about the upcoming sections, because you don't want to endure both the pilot's walking and this bit any more than you absolutely have to. Since all the versions of the game have this bit intact, I would probably have to give it some consideration, but there is no element of danger involved in this bit, and it's basically just moving your little dot to a slightly bigger dot down on Earth. Every other version seems to be similar in execution, but the ACORN version has a clearly faster and differently handling Stealth Fighter to make its way down to Earth. At last, once on Earth, we get into some real action. Basically, the first level on Earth is a side-scrolling shoot'em-up, with focus on altitude. Moving down makes the aircraft climb, and moving up makes it dive. Since you have to dodge some elements on the ground and in the air, pulling the joystick left and right moves the aircraft up and down on the screen, as if banking left and right from the aircraft's POV, and therefore you are unable to move left and right (or more precisely, backwards and forwards) on the screen. Note, that when playing on the easiest setting, you are prevented from hitting the ground, but on the higher difficulty settings, you really need to keep an eye on your altitude meter. So, on with the differences then. First of all, some of the versions have different maps for each city approach run, but they differ so very little in essentials that you hardly notice it, unless you are really bad at this sort of gameplay, in which case the C64 or the Atari versions will be the most comfortable in your case. Next, normally you will get Soviet cruise missiles coming from behind you, if your altitude is too high, but on the SPECTRUM, they will come from ahead of you. Also, the APPLE ][ version was turned 90 degrees to the left, so it's a vertically scrolling version, which makes it easier to get your head around it. The only version that was noticably slower than the rest was on the AMSTRAD, which makes a strange balance for the overly quick hangar section. A minor complaint regarding some versions has to do with the collision detection, in which your bullets have a tendency to fly through targets on ground, although this only means you have to be really precise when shooting in order to hit anything, which is unfortunate, but one can get used to it quite easily. Probably worth noting, but of small significance, is that some versions have the climb and dive controls switched around, but it's only a matter of getting used to either way. It's an 8-bit side-scrolling shooter, and no one should take it too seriously, if the controls don't exactly mirror the way they are in reality. Then you are taken to a single-screen vertical shooter, in which you are required to destroy some missile silos, but before you do anything, you should take a look at how much time you have before the Soviet missiles hit the U.S. target. If you have plenty of time, you should try to destroy as many as you can of the four smaller silos around the larger one in the middle, as you will be awarded with bonus Stealth Fighters for every destroyed silo. Destroying the middle one will result in just one bonus aircraft and a completed mission, before you have to prevent the next launch. Each silo has a small window, which you must fire through in order to destroy it. When you are lined up properly at the target, you will be told of it in one way or another - either the aircraft changes colour, or you will see an X appear in front of you, or your shadow changes colour, depending on the version. You can move your aircraft left and right, and controlling it up and down will make it climb and dive. In this level, all the silos will fire at you, and more of the enemy's heat-seeking rockets will keep coming at you, a new coming on the screen instantly after you have destroyed the previous. The most notable difference that I could find was the SPECTRUM's strange enemy rocket behaviour - they seemed to only come out from the left, while in all the other versions, they come from both left and right, depending on your location at the time of destroying the previous rocket. The least comfortable gameplay was found on the ACORN version, in which your movement is a bit slower compared to the enemy bullets, which makes it more difficult to dodge them. To get to the next section, you have to destroy all the missile control silos from Leningrad, Minsk and Saratov, after which you will be taken straight on to another attack run into the city of Moscow. There, your mission is to blow up the Defense Center, and you will start behind a stone wall in a trench in front of the said building. You are now in control of a soldier using a rocket launcher, and the action screen is viewed in pseudo-3D from behind your soldier. Moving the joystick up and down controls the elevation of the rocket launcher. Enemy soldiers are located on the walls on both sides of the building, and they will fire at you occasionally, so you need to keep yourself on the move. Enemy tanks also appear from the left and right passageways, and will shoot you, if you stay too long in the same place. Your mission here is to blow up the doors at the bottom of the building, and find the correct doorway to get inside. You can also shoot parts of the building to increase score, but are unnecessary for proceeding, except in the ACORN version. Once all the tanks and soldiers are killed, and the correct doorway opened, you will progress to the final section. The best versions of this section can be found on the ATARI and SPECTRUM/ENTERPRISE computers, which have a helpful elevation indicator at the bottom of the screen, and the worst version is on the ACORN, where the controls are randomly unresponsive and overresponsive and you will have a hard time getting the aiming right at all. For the final action bit, you will be placed in a 3D view of a room reminiscent of a squash arena. The view is once again from behind you, tilted slightly from above. Here, you have the company of maintenance robots, the number of which depends on your difficulty level: Beginner level features only 2 robots, Advanced level features 4 robots, and Suicidal level features 5 robots. All the robots make stops on the nine spots on the floor, so that your destroying them is a bit easier, only the last one will stay on them for a shorter time. Your mission is to throw discs at them, as in the Discs of Tron game, but you need to hit the backside of the robots in order to make any damage, because their frontside will only make the discs bump back at you, so you need to make good use of the back wall. On the back wall, you will have your aiming cursor represented as a black spot, which you can move by moving the joystick up and down, which will likely disorient you from time to time, regardless of which way the cursor actually moves, and that depends on the version you're playing. Your soldier can be moved left and right by moving the joystick left and right, but no other way. When you are fighting against the final robot, you will also be given a time limit in which you must destroy it, otherwise you will be killed in action and get the worse ending, or in ACORN's case, no ending at all. Speaking of the Acorn version, it's a surprisingly well made section considering everything else, but you can't catch the discs on their way back, like you can in all the other versions, and the last robot wanders around aimlessly without stopping, which makes it a bit more difficult. Because of these little problems, I have to give the more finely tuned versions the higher score. The worst version of this section can be found, I'm sorry to say, on the SPECTRUM and ENTERPRISE, where the movement of your man and your discs are so slow, that the enemy robot has the chance to move twice before your disc has gotten to the back wall and back to you, so you really need to have either very good luck, or the robot's route of movement memorised, and even then you need to be incredibly precise in order to hit the robot. All the other versions are basically the same, and have a good balance of speed for both parties, in which case you don't need to learn anything more than the way the discs move around the room. All in all, we have a surprisingly mixed lot this time, with most versions of the game excelling the others in at least one section, and by contrast, also having clearly worse sections than the others in comparison. The most consistently good versions are on the C64, the Atari 8-bit computers and Apple ][, while the Amstrad, Acorn and Spectrum/Enterprise versions are let down by a couple of badly made sections. Calculating the scores, then, seems to be imperative in order to make any sort of sense into this mess. The scores will be given by the section in order of appearance, starting from the hangar and ending with the battle with the maintenance robots, plus the controls, which will be put in first. Note that since the Spectrum and Enterprise versions are the exact same game, I will only give the scores for the Spectrum. Access Software had a way of making their games look nicely consistent in their overall looks, even though most of their more well-known titles had many different kinds of playing style variables. This made my work on this game much easier than you would expect, but it's still quite a lot of screens to go through. Like so many times before, the graphics section starts with the title screen, or the menu, however you prefer to see it as. Menu/Title screens. Top row, left to right: Commodore 64, Atari 8-bit, Apple ][. Bottom row, left to right: ZX Spectrum/Enterprise 128, Acorn Electron/BBC Micro, Amstrad CPC. Interestingly, the APPLE ][ version is the only one to copy the original, but the shading in the tilted 3D logo looks a bit messy there in comparison. None of the title screens get the famous hammer-and-sickle design quite right, but it's a curious symbol to represent the game's battles, since it was originally designed to symbol the union of peasants and workers. If the Carvers had included the red star of the communist party on top, it would have been a more direct pointer towards the Soviet flag. Perhaps they just forgot about it. 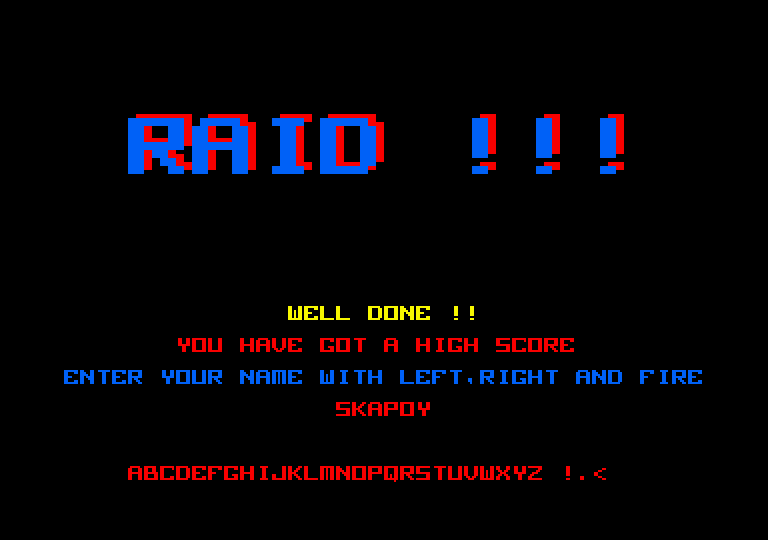 Anyhow, later on, the symbol was omitted from the ACORN version's title screen, and it looks like the AMSTRAD had its release only after the bad publicity forced US Gold to re-release the game as Raid, with no less than three exclamation marks. There is a unique-looking main menu on the SPECTRUM and ENTERPRISE versions, which suits the theme quite nicely, and it's surprisingly stylish, considering it only features minimal amount of graphics and only a good amount of text to go with it. What you can't see in this screenshot is that the blue borders rapidly cycle through colours on each selection, and that the screen actually comes in animated, which is a nice effect for an otherwise seemingly insignificant thing. Sections 1 and 3. Top row, left to right: Commodore 64, Amstrad CPC, Atari 8-bit. Bottom row, left to right: ZX Spectrum/Enterprise 128, Apple ][, Acorn Electron/BBC Micro. When you start the game, the first screen you will see is the satellite view of the northern hemisphere of Earth. None of the screens look particularly pretty, but then again it's main purpose is to show the strategic sectors and some information. At first, you don't even need to do anything other than wait for something to happen, and then press Space to get into the action. As the game's two sides are the United States of America and Soviet Union, it is only fitting that the said countries be highlighted on the map, so the original version of the game has the Soviet side painted red (as is only fitting) and the American side painted yellow for whatever reason. In the ATARI version, the two countries have only been highlighted by their edges; the APPLE ][ and SPECTRUM/ENTERPRISE versions have more colours in the map than is required; and the AMSTRAD version seems to separate the sides as USA versus the rest of the world. Then again, the launch sites are different from the original as well, which could mean that it's not entirely certain that we're on the same Earth anymore. Curiously, the ACORN version is the only one to follow the original to the dot, at least in graphics. But that will change soon enough. Section 2. Top row, left to right: Commodore 64, Amstrad CPC, Atari 8-bit. Bottom row, left to right: ZX Spectrum/Enterprise 128, Acorn Electron/BBC Micro, Apple ][. Now it becomes even clearer, what the problem is with the AMSTRAD and ACORN versions in this section: the hall is considerably smaller and your plane a bit larger in contrast. Add to that the speed differences and the lack of controllability, you got a disaster on your hands. Also, there is a clear lack of information in the two mentioned versions, compared to all the others. Taking all the others into consideration as well, you will notice that they all look very different in both colouring and detail. The least functional colouring is on the SPECTRUM/ENTERPRISE, because you can't see your own shadow. As you can probably see from the screenshot above, I had no idea at the time of taking that screenshot, that I was heading fast towards the ceiling, instead of going out from the hangar doors, until it was too late. The AMSTRAD version is almost as bad, because the floor is so dark that you need to focus too much on that, along with all the three meters below the action screen. The ACORN version doesn't look too bad as such, it just lacks information. The other three are basically the same, albeit in different palettes, so I cannot really place any of them above the others. Section 4. Top row, left to right: Commodore 64, Amstrad CPC, Atari 8-bit. As I mentioned in the previous section, in some versions, these approach runs are always the same, and in others they aren't. Since the differences are practically meaningless, and it makes very little difference overall, we will concentrate on the actual gameplay. The original C64 version is a smoothly scrolling side-scroller, with a heavy emphasis on controlling your altitude. Most of the obstacles on the ground or in the air can be shot, except the trees, the bridges and the yellow strange-looking poles. Apart from the APPLE ][ version being the only vertically scrolling version of the stage, all of the versions follow the original in execution. The AMSTRAD version is dreadfully slow and jerky, which you can actually see from the screenshot, with a clear nudging motion going at the level of the second-lowest pole. All the palettes are drastically different from each other, the closest to the original being the ATARI version. It has to be said, that the ATARI and APPLE ][ versions have easily the best-looking explosions, which make the experience more entertaining than just the differences in palette. Still, graphically the most important thing is how the screen scrolls, so the scores for this section will be given with a basis on that. Quite clearly, the ACORN version shall have some points taken off for the horrible colours and lack of information at the bottom of the screen, but since the scrolling is slightly better than on the AMSTRAD, it shall be considered equally bad. Section 5. Top row, left to right: Commodore 64, Amstrad CPC, Atari 8-bit. Again, the colour schemes are quite different here, but the most disturbing graphical difference is on the SPECTRUM version with the questionable-looking missile control silo in the middle. As before, the ATARI and APPLE ][ versions have the best explosions, but the AMSTRAD version looks quite nice with its more colourful background. All the others will take the second place. Section 6. Top row, left to right: Commodore 64, Amstrad CPC, Atari 8-bit. Before I started writing this blog entry, I don't think I have ever really knowingly seen the Kremlin anywhere, although it has perhaps been featured in some movies. So I looked up some pictures of it from the net, and I think the C64 version gets the closest to looking like the actual building, although none of them quite do. 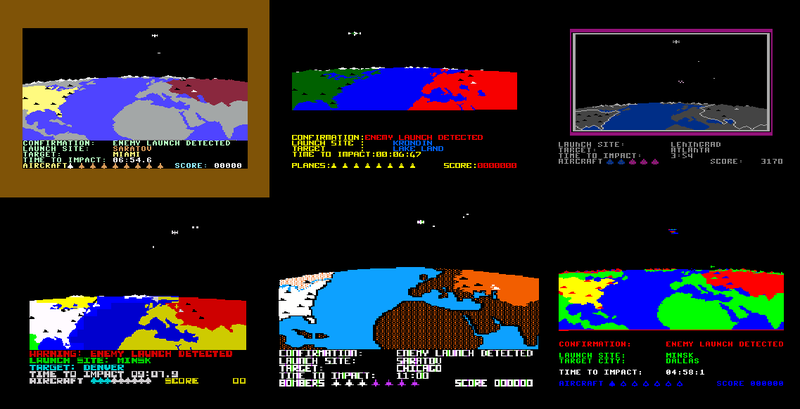 All of the versions have their own problems - the ACORN version hurts your eyes with its way too colourful setting; the ATARI and APPLE ][ versions have the big middle bit from the Kremlin building in a rounded shape, when it should be more like the others; the side walls on the SPECTRUM/ENTERPRISE version are strangely blocky; the C64 version is intensely brown. Apart from the middle thing on top of Kremlin, the ATARI version is the most pleasing to look at, due to the animation details. Section 7. Top row, left to right: Commodore 64, Amstrad CPC, Atari 8-bit. The final interactive bit in the game is the most difficult to judge. The SPECTRUM and C64 are as intensely red and brown, but the slowness of the SPECTRUM version is more painful to go through. The AMSTRAD version looks the best just because of the holes being more 3D'esque, and I prefer the colouring more there than in any other version. However, the animations are once again the best on the APPLE ][ and ATARI versions, which earn them some serious points. The ACORN version isn't too bad - at least it plays smoothly enough, but the colouring is a bit strange, much like it is in the APPLE ][ version. Good endings. Top row, left to right: Commodore 64 #1 & #2, Acorn Electron/BBC Micro, ZX Spectrum/Enterprise 128. Bottom row, left to right: Atari 8-bit, Amstrad CPC, Apple ][ #1 & #2. In the original C64 version, you will see the reactor explode far in the city, and if you make it through the final stage alive, you will see your Stealth Fighter fly towards you before the final text gets typed on the screen. The most impressive endings are on the C64, ATARI, AMSTRAD and APPLE ][, while the SPECTRUM version gets a bit lacklustre version of the same thing. Still, it's not nearly as bad as the only ending on the ACORN version, which is another overworld satellite view with a little flashing dot where the reactor explodes, and the text getting typed below the screen afterwards. Bad endings from Amstrad CPC (left) and ZX Spectrum (right). Just to show you some idea, what the worse endings look like, here are two screens that I could bother to get, from the AMSTRAD and SPECTRUM versions. Again, it's a seriously mixed bag, but overall, I think it looks a bit clearer than the previous section. The ATARI and APPLE ][ versions have the best animations, the ACORN version looks the most uncomfortable regarding colours, and the C64 version is graphically the most balanced one even if it's very brown in places. The two left just fall somewhere in between, both having just about enough plusses and minuses to consider them equal. For a change, this section should be relatively easy to get through, since none of the versions of the game have any music, unless you count the US Gold loader tunes (Star Spangled Banner etc.) on the C64 tape version. And for the sake of greater equality, I will not take that into account. However, the game has plenty enough of levels to get through, and every one of them will have to be taken separately into consideration. Starting with the original C64 version, the menu has no sounds whatsoever, and the first sound you will hear will be the bleepy warning signal in the first sequence, once the enemy launches their first missile attack. Next, you will be taken to the hangar, where your man walks down to the aircraft in the middle and takes off. The sounds that will be heard in this section are the walking steps, your man's "teleportation" inside the aircraft, the aircraft powering up, and two types of movement noises from the aircraft - and of course, the crashing noise if you collide with the walls. Once outside, the map screen now plays a smaller beep signal for whatever reason, probably to make your aircraft's presence known. Approaching the enemy cities will bring another sort of explosion noise to the mix, along with a small beep to notify when an enemy cruise missile comes on the screen, and a "pzzheeuuww"-type shooting sound effect. The next section doesn't really add much to the previous section, but the primary noise is a bit higher than previously, which might come from the guided missiles instead of your own aircraft. Destroying the Kremlin adds another couple of types of explosions and gunshot noises to the mix, and the final scene with the discs and the maintenance robots gives you two extra sound effects, which are for when your disc bumps off the robot's front, and your man's jumping after a successful robot destruction. Familiar effects from the game's sound library are utilised in the ending sequences. All in all, it isn't a particularly varied or interesting soundscape, but works very well in the context. Moving on to the SPECTRUM version, then. 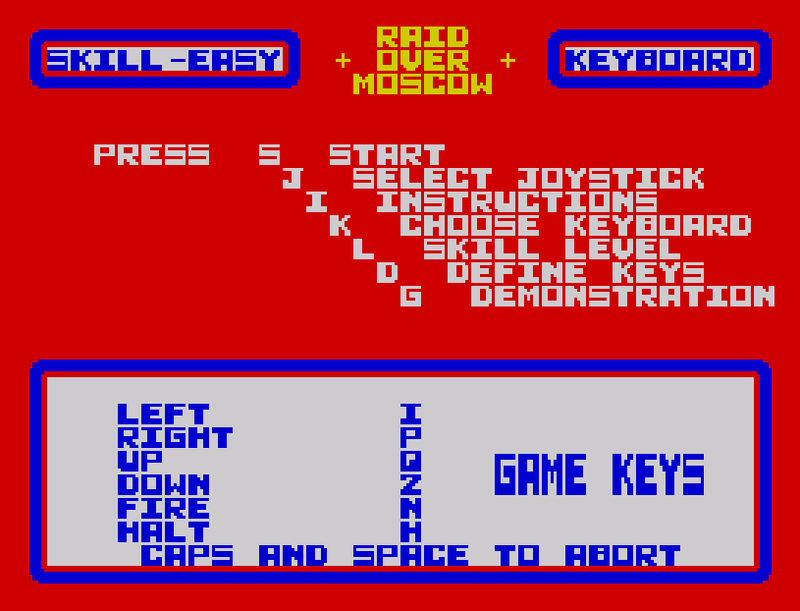 The actual menu screen (the red one) has a couple of sound effects: an chromatically ascending sweep of ultra-short beeps, and a single beep for redefining each key. The first in-game sounds are played in the hangar section, which are basically two differently pitched distorted beep noises. Next time you hear sounds are in the side-scrolling city approach sections, where you will hear a constant fart noise, which will change pitch depending on what's happening on the screen. I counted five different pitches for the noise. The missile silos screen also has a constant fart noise, but it's of one pitch, and instead changes intensity depending on yours and the enemy's movements. At least you get some nice explosion sounds, of which the missile control silo's explosion is the most impressive. Next up is the scene in front of Kremlin, wherein you will hear the most varied set of sounds on the Spectrum. The first thing you will hear is your man spawning behind the wall, which is another ascending sweep. The most prevalent noise is the high-pitched droning of the tank going back and forth in front of the building, but the other sounds will overrun it, so it's not that bad. Your firing the bazooka makes another ascending sweep, but it's a clearly different one than the previous ones. Shooting down enemy soldiers only gives a minuscule beep sound to acknowledge a hit, but blowing a tank and parts of the building will make a nice explosive sound. If you shoot the two highest towers, they will fall down and give a descending version of the bazooka shooting noise. Then we get to the final section, which has four sounds: one low beep for each step your man takes (the same when performing the victory jumps), a LOOONG 6-tone ascending-and-descending distorted beepathon for every disc you throw, a high tick kind of a sound for hitting the robots in any way, and a quick explosion sound for a robot's destruction. I would say the Spectrum version has a varied enough sound library, but it can drive you a bit mad occasionally. The ATARI version starts off like the original - no sounds whatsoever in the title screen. The warning signal in the beginning of the game is more pronounced, and sounds more like a proper warning signal than the one in the C64 version. Then there's the familiar short blip-sound to mark the progression of the enemy missiles. In the hangar, you will hear four different kinds of noises: three different ones for handling the aircraft, and one for opening and closing the doors. In the side-scrolling section, you will only hear your own maneouvers, which are all just a certain type of a noise, along with a few different (and distinctive) explosions and the firing of your own weapon. The screen with the missile silos takes a few sounds from the previous section, so nothing new there. In front of the Kremlin, you will only hear some gunshots, explosions, your score ascending and your death, which is a strangely comical tinny downward arpeggio; it's almost disturbingly quiet. Then comes the fight with the maintenance robots, which for once has a very suitable set of sounds. First comes the lowering of the robot into the room, which is a nicely mechanical sort of sound. Then, you come in walking, and your footsteps actually resemble footsteps more than in any other version. Throwing the discs sound nicely airy, and only make some noise when you actually do the throwing motion, and when the disc hits something. One effect for hitting the wall, one for catching it, one bumpy sound for hitting the front of the robot, one explosion for hitting the back of it, and one noisy explosion for destroying it. And as in the previous section, you will hear your score increase in an ascending sweeping droney sound. Finally, the ending scene has a great explosion, and the beeping of the telegram text coming on screen, along with another round of bonus score increasing sounds. Strangely enough, the ENTERPRISE 128 version has some differences to the 48k Spectrum, and here it comes. The sound library for this version is vastly improved, and even has some polyphonic effects. I imagine this is what the 128k Spectrum version would have sounded like, had one ever been released (though I might be wrong, and I just haven't found it yet). Although you get less sounds for the menu here, you start the game off with a proper warning signal and the familiar short beeps. The hangar scene has a nicely ascending beep for powering up the aircraft, but it has a low hissing noise in the background as well, which is nice. The hissing noise continues, once you get to the side-scrolling bit, but you get a nice array of other sound effects on top of it as well: a downward-sliding beep for shooting, one sort of explosion sound, a nicely flapping sound effect for the choppers, and a low droning sound for the tanks. Again, a smaller selection of sounds from the previous section are used in the missile silos scene. The Kremlin scene has five sound effects, from what I could find: one for your shooting, one for their shooting, one explosion, one for your death and a similar extra sound effect for shooting down the highest towers. The fight with the robots is supremely annoying: you will hear an up-and-down sweeping low droning noise throughout the level, which will take 4 minutes to play through at the very least. In addition to that, you have a similar, but much less annoying flight noise for the discs as you have on the 48k version; a "cling" tone for the disc to bump off of the robot's front, a thud for hitting the back wall and a couple of explosion sounds, as you would expect. If it weren't for the superbly irritating constant up-and-down sweeping noise in the final level, I might have gone so far as to say this version sounded almost as good as the C64 version, but all in all, it's not too bad. The AMSTRAD version starts off with a bit of a downer - the warning signal is a low "wub wub" kind of a sound, and you get no high short beeps for indicating the enemy missiles' movement. Inside the hangar, you will only hear some air noises, nothing else. On the ground level, an explosion noise and a shooting sound are added to the list. In front of the silos, the flight noise is a bit higher, but the other sounds are the same. The Kremlin scene (or Llandas, as it is in this version) has only three sound effects, from what I could gather: two types of explosions and one gun shooting sound. Compared to all that, the final action scene has a surprisingly versatile set of sounds: you get two differently pitched "ping" sounds for the disc to hit something, a regular explosion noise and two types of robot droning noises - one slower and one faster (the faster obviously being played while the last of the robots is in the room). In the ending sequence, you will only hear the reactor explode, which is all you could have expected, really, so the whole sound library in this version is a bit of a downer, really. Another downer could be considered when you start up the APPLE ][ version. The first sound you will hear from it is the low nondescript noise from your aircraft, once you start handling it. The next sound you will likely hear is the default explosion sound, which goes for most of the explosions in this version - it sounds more like an alien scream than anything. Only when you destroy something solid and unmoving, you will hear a more traditional kind of an explosion, which is actually rather nice. The scrolling shoot'em-up bit has some other sounds as well: the cruise missiles' low droning noise and some effective shooting sounds. In front of the missile silos, the only new sound is the explosion of the control silo, which is another scream-type explosion, but longer and higher in pitch. The only two new sounds that the Kremlin scene brings are your death sound, which is a more traditional 8-bit type of a scream effect (meaning, worse than the screaming explosion), and your bazooka shooting sound, which sounds almost exactly like something from the Spectrum. The final battle only adds one sound effect to the mix, and that is the disc bouncing off of any surface, which gives a short tick-like sound. Although this version starts off on a low note, it gets gradually better, and is certainly one of the better ones in the set. Last, although not quite the least, the ACORN version, which begins familiarly enough - with the good warning signal, familiar from the Atari version, along with the familiar high short beeps. The hangar scene only has two sound effects in addition to the dull air noise that only alters in volume; they are the powering up of the aircraft, which is an unusually quick ascending sweepy beep, and a low beep of the doors opening. In the side-scrolling bit, you get a constant air noise from your aircraft, but the stage starts off with a strange sort of descending effect. The section also carries the usual amount of sound effects: one for shooting, one for choppers (flapping), missiles (descending beep) and tanks (low noise), all of which are good enough, but the explosion sound is quite unusual, which I really can't describe properly, but it mostly reminds me of Mario getting an enlargement mushroom. What is even more peculiar is that all the sound effects that appear in this section, are pretty much all the sound effects that appear in this version of the game AT ALL. Some of them have different purposes in the other sections, but all the sounds are the same, and I seriously cannot be bothered to write everything in detail this time. Clearly, we have one of the rare cases of the original not being exactly the best version around, as much as I would like it to have been. There is an obvious reason to this, of course, which is nearly two years of development time for the Atari version, but that is no excuse. There are some unique features in the original, that haven't been translated properly to other platforms, if indeed at all, but there are also some unique features in other versions that aren't necessarily available in the original, so at least half of these versions are well worth taking a better look at. Enough of that now; let's take a look at the final mathematical scores then. I'm not entirely sure I agree with some of the scores here, but as a whole, there shouldn't be too much to argue with. At least, the rating at CPC Game Reviews is now very much understood. All that I have left to say now is, that Raid Over Moscow has certainly made its mark in gaming history, and should be in every gamer's general knowledge. If nothing else, it definitely is in ours. Thank you very much for reading, see you next time! Comments, corrections and suggestions are always welcome! Although I never played any version but the C 64, it would be but prejudicial of me to assert that, that version is the best of the best, however it probably is the version by far most played, which would incline me to believe it's development was of greatest priority over the others, and thereby the better of the lot.